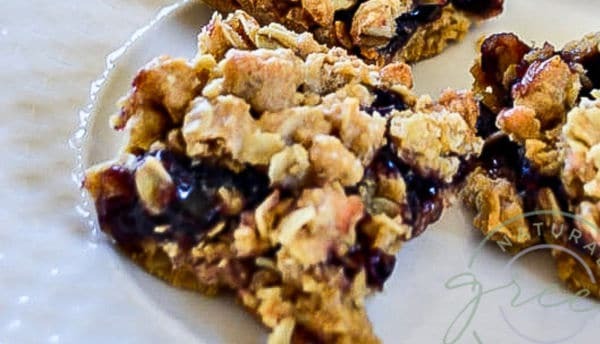 Oatmeal jam bars made from whole foods. 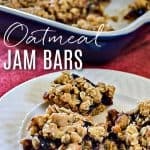 I could not decide: Are these oatmeal jam bars a breakfast recipe, or are they a snack recipe??? Truth be told, they are perfectly suited to both. Let’s talk about this naturally sweet label, shall we? These bars use maple syrup as the sweetener. Maple syrup is still a sugar in the body. But, it has some nutrients and antioxidants that make it a “better” sugar. The truth is, between the jam and the maple syrup, these have just the right amount of sweet and are a hecka lotta healthier than a cookie. Not only do these taste great, but you only need one bowl. I love anything that doesn’t create a ton of dishes and extra work. 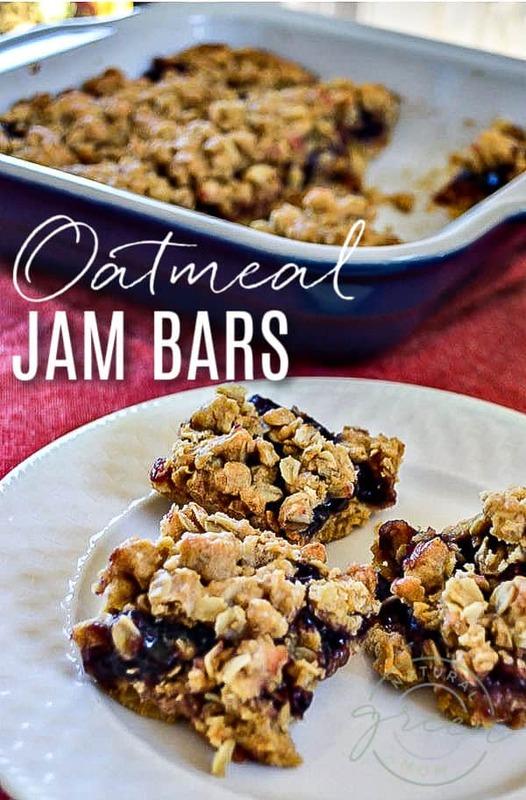 These oatmeal jam bars are a great substitute for processed foods such as NutriGrain Bars. And they taste waaaay better. If you’ve never tried white whole wheat flour, you can find it in any grocery store. It is a whole wheat flour but it has a lighter taste. In a large bowl, stir together coconut oil, flour, oats, maple syrup, baking powder, and salt. Press half oat mixture into a 9x9 pan. Bake for 15 minutes. Remove from oven and allow to cool slightly. Spread jam over bottom crust. Crumble remaining oat mixture over the top. Return to oven and bake an additional 25 minutes. Allow to cool before cutting into 9 to 12 pieces. Cut the bars into 12 small pieces. 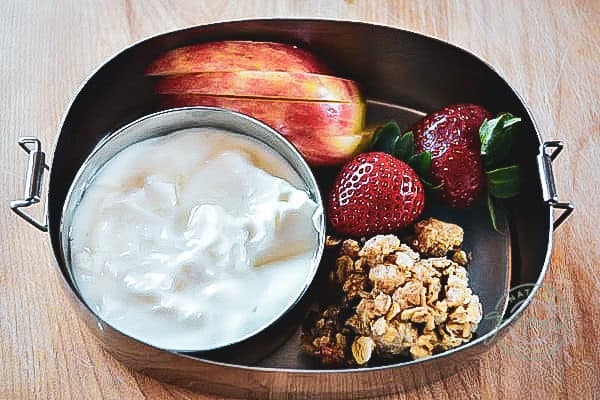 Tuck into a box with sliced apples and strawberries and a small container of yogurt. These boxes will stay in your refrigerator for up to 4 days IF you place the apples cut side down in the box. If you have trouble getting out of the house in the morning, make these on a Sunday and enjoy for breakfast in the upcoming days. Or do like I do and enjoy a box with a hot cup of tea for a 3:00 in the afternoon pick me up! Previous Post: « Activated Charcoal Save 39%!